Proud Mary Keeps on Burning - Cursed To First - Sox and Pats forever. Remember last winter and all the butthurt over whether or not the Sox would have offense? Somehow, even with all the injuries, this team keeps stamping out wins, and they remain third in the league in batting average, second in home runs, second in hits, and first in RBI to boot. Last night that charge was led by none other than the Large Father himself, who reminded us he still knows his way around a batters' box with a towering shot off James Shields (who threw a tantrum on the mound before the ball had even left the park) into the right-field corner -- almost the same spot where Papi's Game 4 home run landed off Paul Quantrill back in 2004. This came after a tense, scoreless, first four innings -- you could hear in Don Orsillo's voice how good it felt to call out, "Ortiz! To deep right field!!" 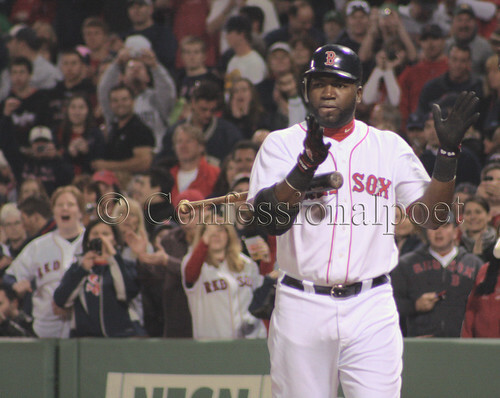 Papi even did that little flourish with his bat at the end of his swing, the way he does when he knows he's really connected. Just like old times. The beatings continued with extreme prejudice after that, featuring a key hit from Jason Varitek and a Bill Hall homer, till the score was so lopsided I began to wish run differential mattered in the standings the way it does in the World Cup tournament (our bullpen gave some back, so in the end it's probably for the best that it doesn't). All this wasn't against some NL basement-dweller. This was against one of our chief rivals in the AL East this year, and put Boston within a game of first place in the division. And the three chief players in that effort were known back in April as our washed-up DH, our creaky old batless catcher, and some random dude we picked up from Seattle. We'll keep relying on players who may not be household names to most of our fans, but are here for a reason. We'll continue to find ways to win and there's a really good spirit about this club and everyone is pulling for one another and we've thrived on getting those contributions from some unlikely sources. We need to keep that going. But perhaps we've said too much.